Bright, colourful, healthy and delicious...and the kids are going to love it! A fun way to enjoy all the colours of the rainbow in one rainbow fruit wrap. Prepare all of the fruit for the wraps. Slice the fruit into small pieces so that it is easy for kids to bite and chew. Spread a thin layer of yogurt all over the wrap. This will be the glue that holds the wrap together. 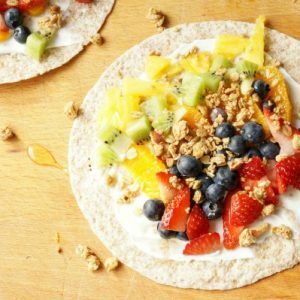 Arrange the fruit all over the wrap. Place the largest slices in the middle of the wrap. Let the kids decide which fruit to include in the wrap. My daughters don’t like the same kinds of fruit, so the wraps are filled with a different selection of fruit. Roll up the wrap. This will be messy – you have to just go for it. Squish the fruit inside. When you wrap it up, poke a toothpick into the wrap to keep it closed. Slice in half and enjoy.